On Sunday 10th September, despite the weather the Festival of Transport at Merthyr Tydfil Leisure Centre drew visitors from many parts of South Wales. 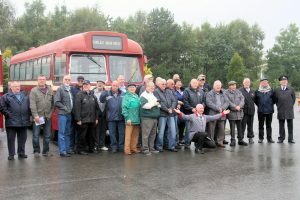 At the event the bus preservation group brought out their latest restored bus, a 24-year-old early Dennis Dart, originally new to Rhondda Buses. Mike Taylor, the Chairman of the Cardiff Transport Preservation Group which organised the event said “Our plans altered due to the weather, as it was not going to be good for our open-top buses, but we brought along several closed top buses and the many visiting vehicles made the day interesting – Several classic cars did come along but not as many as expected. Somewhere in the region 80 classic and modern cars came, including some iconic American fish tailed Cadillac’s and British icons such as the 1950 and 1960 Morris Minor and original Austin mini’s. 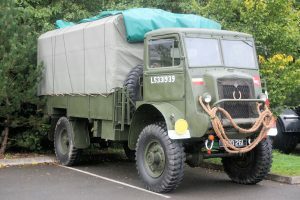 On the commercial side, there was much interest in a World War II Bedford QLD truck in the colours of the Eight Corps, British Army, Royal Electrical and Mechanical Engineers. It was also good to see about 30 former Merthyr Tydfil busman have a reunion led by our now CTPG volunteer Elwyn Jones, Painter and former Union leader with Merthyr Tydfil Borough Council Transport Department plus their former Manager Glyn Bowen, and a special heritage bus trip was arranged too.At the festival, a surprise visitor from Somerset was a former AEC Regent V new in1967 formerly with Pontypridd Urban District Council as their no 4, a double deckerconverted into a mobile home, and painted green. Interestingly, owners Paul and Sam Bateman converted the bus with beds, cooker unit, lounge and shower and used it on their honeymoon 25 years ago. Having celebrated their 25th wedding NEWS RELEASE MERTHYR TYDFIL 11th September 2017 anniversary in August this year, they decide to re-visit Wales and have a look at the preserved former Pontypridd AEC No 8, running free trips on the day. Amongst the visiting buses two red ones joined in running free trips during the day, a 1973 Marshall of Cambridge bodied Leyland Leopard in Midland Red Wyvern colours and a 1979 Bristol VR double decker from the Swansea Bus Museum. 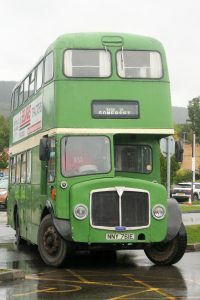 Buses from the heritage collection at Barry running trips included the groups newly restored maroon Rhondda Dennis Dart, and Rhondda Mercedes restored last year;an orange and white 1996 Cardiff Metrorider, and three double deckers from he 1960s. These included the dark blue and cream Pontypridd AEC; a green and cream Caerphilly Titan, and a bright blue and ivory Bedwas & Machen Titan. Jones International of Llandeilo who brought along their yellow coach, helped out on the free trips to Rhymney Brewery.Mike Taylor, added “whilst the weather was against us, those that came were not disappointed and we ran all our programme of free trips. We would like to thank all those that came and to our sponsors, R.T. Williams, Sixty-Sixty Coaches, the Brecon Mountain Railway, Rhymney Brewery, Griffin Mill and Newtown Motors”.